Every Sunday night I find myself baking some sort of treat. I pack lunches for the Ranch Hand/ Sales Rep, and the kids for school every week. So by the time the week and weekend is over, I have nothing sweet in my house. My kids can't take peanut butter anything to school because of other children with nut allergies, so that dampens my enthusiasm sometimes. I wanted to make chocolate something, but I just did brownies and chocolate chip cookies the last couple times. I decided to take a chance, combine a couple recipes, add and take out what I wanted to, and see if it would be good. According to the cookie snitching Ranch Hand, they were awesome! Bake at 375 for 8-10 minutes. They are really good under baked, right at 8 minutes. But I ALWAYS over bake some in honor of my Grandma Armstrong. I never burn my cookies on accident! It's true, I do it on purpose. Add and mix the butter and shortening, then the eggs. Mix in the baking soda, salt, cocoa and flour. Then add the chocolate chunks when your dough feels cookie-ish. These Nestle Toll House chocolate chunks were on sale last week at my local hometown grocery store. Wait till things come one sale, then stock up! Yes, this dough is very cookie-ish. Use an ice cream scoop, it's fun and makes perfect shaped cookies. 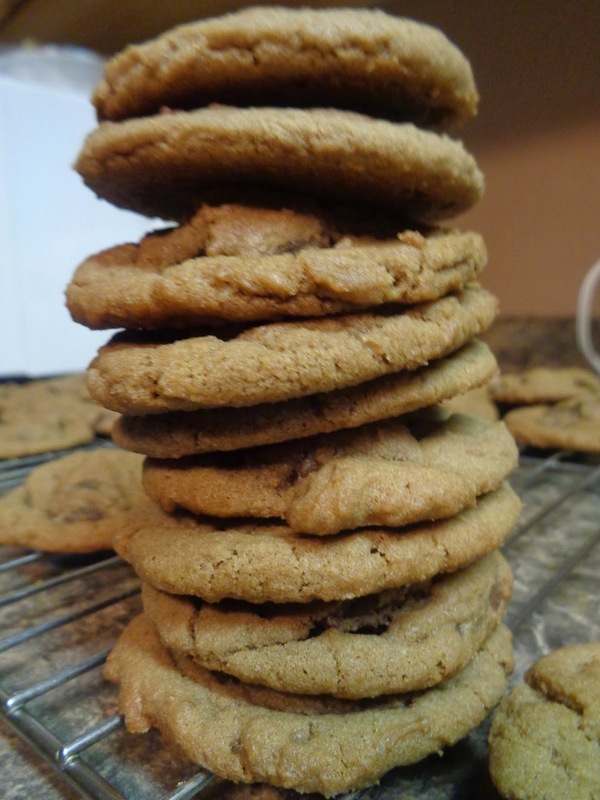 Stacks of cookies lookin' good!